A lung disease is any lung problem that prevents your lungs from functioning properly. Lung diseases are very common. They can result from smoking, infections and genetic problems. Lung diseases are usually treated by pulmonologists and/or thoracic surgeons. 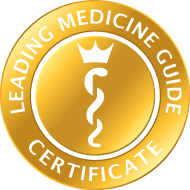 Here you will find highly qualified lung specialists. diseases of the airway – these diseases affect the tubes or airways carrying oxygen and other gases to and from lungs, and commonly cause a blockage or narrowing of the airways. diseases of the lung tissue – these diseases can damage the structure of lung tissue, making it difficult to fully expand the lungs, which in turn restricts the supply of oxygen and the release of carbon dioxide. diseases of the lung circulation system – these are diseases that affect blood vessels in your lungs and are often the result of clots, scarring or inflammation. They also affect lung function, making it difficult to take in oxygen and breathe out carbon dioxide. A number of common lung diseases can involve a blend of these three types. Asthma is a fairly common disease, in which the airways are continually inflamed. Typical symptoms include episodes of coughing, wheezing, tightness in the chest region and shortage of breath. Sometimes these symptoms are more severe during exercise, or perhaps at night. Pollution, as well as allergies and infections may also cause asthma symptoms. pneumothorax (collapsed lung) happens when air escapes from the lung and collects in the cavity between your lung and chest wall. A build-up of pressure prevents your lung from expanding normally as you breathe. This condition is commonly caused by an injury. atelectasis (usually a partial lung collapse) occurs when your bronchial passages are blocked, or where there is external pressure on the lung. This condition can occur after a surgical procedure. 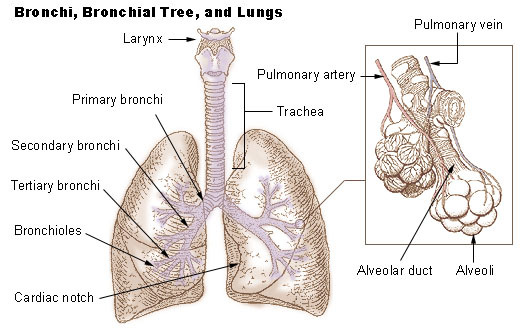 Bronchitis is swelling and inflamed tissue in the main passages (bronchial tubes) carrying air to your lungs. As a result of this narrowing of your airways, it then becomes harder to breathe. A bout of bronchitis is usually accompanied by a cough and the presence of mucus. This condition can follow on after a cold or flu, and is considered to be a viral infection. COPD is an obstructive lung disease in which there is continual poor airflow and a marked inability to breathe out (exhale) normally. The main symptoms of this condition include a shortage of breath and a cough that produces sputum. Because COPD becomes progressively worse over time, it can often affect everyday activities (e.g. climbing the stairs). Smoking is a major cause of COPD, with air pollution and genetics also implicated to a lesser degree. non-small cell lung cancer is more treatable and by far the most common kind of lung cancer. small cell lung cancer represents about 20% of all lung cancers. Lung cancer is a major cause of death among older adults and is primarily caused by cigarette smoking. Pain may worsen when you breathe deeply, and you may need to clench your chest or bend down in pain.